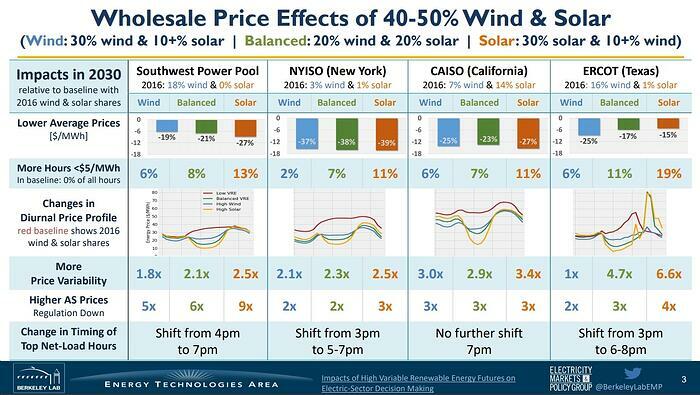 Lower Average Prices: "Growth in VRE can decrease overall average wholesale market prices by $5-$16/MWh"
Increase in irregularity of wholesale prices, especially with high wind: "Stronger price variability and irregularity will favor flexible resources that can start and stop frequently and on short notice, including storage. " Changing diurnal patterns especially with high solar: "The most dramatic shift can be seen in the high solar scenarios across all regions, when prices decrease by $25-$40/MWh relative to the low VRE scenario over the middle of the day"
For some excellent coverage of this report, see David Roberts' piece at Vox, which emphasizes that increased solar and wind power penetration is coming, but that there is a "haze of uncertainty" in which "the people who manage US electricity markets and infrastructure, who must make decisions with 20-, 30-, even 50-year consequences, are stuck making high-stakes bets." As Roberts puts it: "things will look different in an electricity system with lots of variable renewable energy (VRE) — different prices, a different shape of demand, different timing, different needs — and if the people managing the electricity system bet on low VRE and get high, they are going to screw up all sorts of things." For instance, Roberts explains that increased VRE will change the shape of daily demand (e.g., the "duck curve"), will make prices "more volatile," and will make "the services that support it [e.g., "things like spinning reserves, frequency and voltage regulation, demand response, and, most notably, storage"] much more valuable." For its part, Greentech Media (GTM) emphasizes the potential for significant declines in wholesale energy prices - " by as much as $16 per megawatt-hour" - in a high VRE scenario. GTM also notes "the need for more dispatchable resources that can quickly respond to changes in demand or production," as well as "[p]rices for ancillary services increased by up to nine times under the new scenarios." 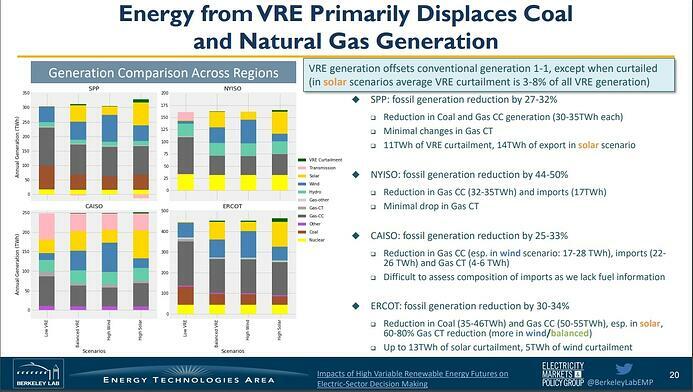 In sum, a future in which VRE generation - largely wind and solar - grows to a much larger share on the grid, is highly likely and will be overwhelmingly beneficial. However, there will be adjustments that need to be made by grid operators, policymakers, investors and clean energy companies. That's why studies like the one by LBNL are so valuable, and deserve to be paid serious attention.